Wiltshire County Archaeology Service began work on the Wiltshire Historic Towns Survey in August 1999 as part of the national EUS programme instigated and funded by English Heritage. The project comprised a survey of the historic towns of Wiltshire, including those in the Unitary Authority of Swindon Borough Council. 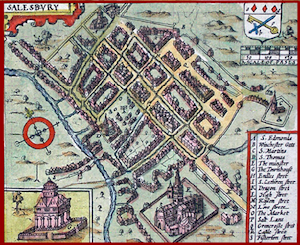 In all, thirty-four towns were surveyed, including the five rural Roman towns and the city of Salisbury between 1999 and 2004. The intention was to update a project sponsored in 1976 by the DoE which resulted in the publication of Wiltshire Towns: the archaeological potential (Haslam, 1976) so as to provide high-quality information about the archaeological potential of the towns for archaeologists and Local Planning Authorities. The project was carried out on behalf of Wiltshire County Council who acted as archaeological advisors on planning matters for the Wiltshire County Council and Swindon Borough Council, and maintain the Sites and Monuments Record for both Authorities. A number of people were involved in drawing up the EUS. Tim Robey and Stephanie Chettle, started the project before Phil Mcmahon took over from them both in 2000. The bulk of the reports were complied by Phil Mcmahon, with the assistance of Bill Moffat for Sorviodunum, and Duncan Coe for Devizes and Marlborough. On Phil Mcmahon's departure the remaining reports were completed by Roy Canham, (mainly Swindon), Helena Cave-Penney (mainly Salisbury), Claire Young, undertaking research and finalising the drawings and, Margaret Underwood finalising the text.